Collective Efforts of a Society can even Move A Mountain through Online Fundraising! Social funding is much more than reaching the online donors and accumulating more money but it’s all about spreading the divinity of your cause. Whatever your cause may be, it directly or indirectly affects the entire humanity. Every Penny you raised for yourself or a group finally goes back to the society and ultimately to the individual who has donated the money to support your cause. The money donated by an individual may come back to him/her as an unconditional love or help from the society itself. No act of kindness is lost in this world and it’s contagious and the love and respect one show to the fellow beings is replicated back. You may call it karma or any other spiritual name but you simply can’t deny the process. The beauty of fundraising for a cause is that the more donors funding the cause, bigger the impact it has on society. The benefit of social fundraising is that you can reach more people with very little time and effort. Nowadays, there are many fundraising sites through which you can raise money for a cause. Whether it be to help achieve your dreams or help someone else for a cause, online fundraising is a convenient way to bridge between donors and receivers. And a new bridge in the name of Move Your Mountain has emerged as a platform for fundraising and contributing to the society. With their motto “Social Funding Simplified”, MYM was started in 2013 in a small office space in Reno, NV. 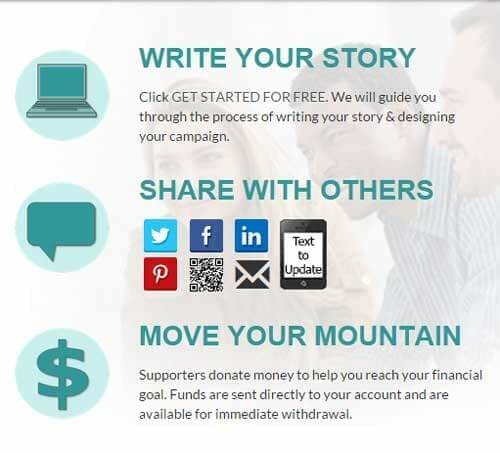 With the help of developers, programmers, and graphic designers…Move Your Mountain has helped hundreds of people raise thousands of dollars in their first year alone through online fundraising. Anyone can start a campaign on the Move Your Mountain website. So how do you start your Campaign and Raise money in MYM? It’s simple. 1. Just write your story for the fundraising campaign and have a goal of how much amount you need to raise. 2. Share your campaign with your friends, family and anyone in the world through social networking sites like Facebook, Twitter, etc. 3. People donate to your campaign and you can withdraw money anytime you want. You must be wondering how much fee you have to pay to setup your campaign at MYM! What if I tell you it’s absolutely Free for you to set up your campaign and raise funds. The only fee that MYM deducts is a nominal charge from the donations received. That means no burden for you regarding any fee. Among many fundraising campaigns that people have raised money for a cause, one such campaign I would like to highlight here. It’s about The True Love Bucket List Couple campaign. Alicia met Andrew Drew in 2004 at a church. He was in love with Jesus and shared the compassion, sympathy, empathy, and unconditional love of god with the people around him. Alicia instantly knew that he was the one for her and fell in love with him. As god has intended they soon married and have been married for almost 10 years. But tragedy struck their life in the most painful manner. Andrew had type 1 diabetes when they married, he also suffered from an autoimmune issue called Alopecia Areata. During their first year of marriage, Andrew’s health dramatically declined and he lost a lot of weight and suffered from severe migraines and nausea. He also lost all of his hair and was diagnosed with sterile meningitis. Even though Alicia tried her level best to provide Andrew with the best treatment available Andrew’s health kept on declining. Andrew had his first grandmal seizure and was diagnosed with epilepsy later that year and this devastated the couple’s hope for a better future. Andrew was diagnosed with AAG (Autonomic Autoimmune Gangliopathy) in 2011 which made him wheelchair-bound. His blood pressure drops to about 60/30 whenever he tried to walk. By September 2014, Andrew was diagnosed with Hepatic vein obstruction and this condition caused blockage of the hepatic vein, which carries blood away from the liver. Andrew is currently in stage IV liver failure. Liver transplant is an option but due to his previous autoimmune conditions he is not a candidate for liver transplant surgery. Doctors have given him a vague timeline of “months to years to live”. The couple has created an online fundraising campaign – TrueLoveBucketList and they are determined to spend every moment they have together fulfilling their true love bucket list. You can be a part of their hopes and dreams by donating to this wonderful cause. Get Inspired and Inspire Humanity through Online Fundraising! Awesome post which contain very useful information about Online Fundraising To Inspire Humanity & Serve Society. Very interesting and informative article. I liked it. Thanks for sharing our site! We love helping people raise money for the things that they need. Thanks for sharing this information. I will have to refer people to this.